The Khon masked drama draws its story line from the Ramakian, the Thai version of the Indian epic Ramayana. Khon performances are characterised by vigorous, highly-formalized action. Acting and dancing are inseparable, and each step has a definite meaning, which is emphasized by precisely defined music to suggest walking, marching, laughing, etc. 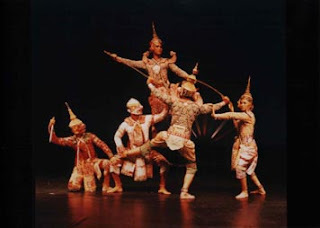 Until the 19th century the Khon was acted by men playing both male and female roles. By the mid 1800s both men and women were appearing on stage together. The actors are often masked and cannot speak, so narrative verses are recited and sung by a chorus that sits with the accompanying musical ensemble. The leading male and female performers do not wear masks and may occasionally speak. The highly decorated papier mache masks are works of art and perfectly portray the characters' personalities. Major characters can be identified by the predominant colours of their costumes. Phra Ram, the hero, wears green. His brother, Phra Lak, wears gold and Hanuman, the monkey-god, wears white. Simplest of all in form and presentation is Lakhon Chatri which can be seen at shrines when dancers are hired by those whose wishes have been granted to perform for the shrine deity. Lakhon Nai is graceful, romantic and highly stylized. Plays were originally presented only in the palace. Lakhon Nok was performed outside the palace and acted only by men. Filled with lively music, off-colour humour, and rapid, animated movements, Lakhon Nok was the ancestor of the enormously popular Likeh folk theater which is still a feature of many provincial festivals in Thailand. Likeh, containing elements of pantomime, comic folk opera, and social satire, is generally performed against a simply painted backdrop during temple fairs. Its court-derived stories are embellished with local references and anecdotes, and spontaneous dialogue is filled with outrageous puns and double entendres. 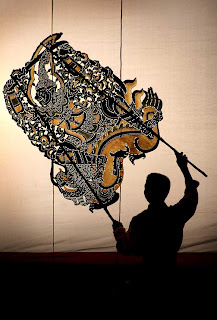 Two other dramatic forms are the Nang Yai shadow plays and Hun marionettes. Intricately fashioned cowhide figures are held against a back-lit white screen. The Ram Muay is a Muay Thai boxing dance that precedes every Muay Thai match. It is a form of Wai Kru and is a way for Muay Thai boxers to show respect to their teachers. It serves as a graceful expression of the special relationship between a Muay Thai boxer and his trainer. Muay Thai regulations specify that both fighters must perform the Ram Muay before every bout. The Ram Muay usually lasts about five minutes and is done through a series of gestures and movements performed on the stadium in rhythm to ringside musical accompaniment.